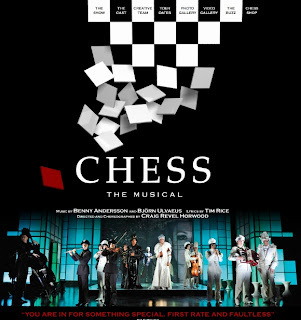 Last Saturday evening, Roma, my sister Kayo, and I went along to see "Chess - The Musical" in the Grand Canal Theatre. With music by Björn Ulvaeus and Benny Andersson (of ABBA fame). I was really looking forward to a great evening's entertainment - I was not disappointed. 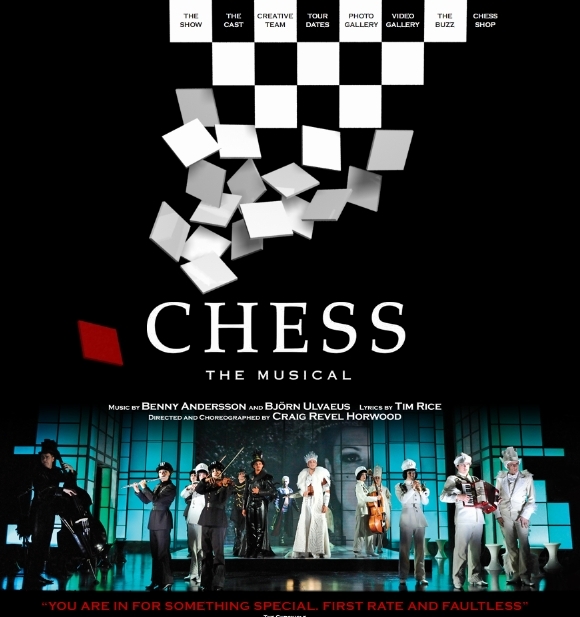 Image from Chess - The Musical web site. I had not seen this show before, and other than the two most famous songs I know him so well and One night in Bangkok - I knew very little about it. In fact, I didn't even know it as about the game of chess! This is a fantastic show - great music, excellent dancing, outstanding costumes, and wonderful singing. All with the old East/West political undertones too. We wondered about the presence of an orchestra, but the cast played all the instruments on stage - except for drums and keyboards which were at the side. There was even a webcam in one of the trumpets which fed to a giant screen at the back of the stage. The Grand Canal Theatre has great views from all seats, but I have to say that seats right in the middle of row 16 in the Stalls must be just about the most perfect seats in the house. We had an excellent quick dinner in the Ely Bar & Brasserie (in the IFSC) before hand. Great service and nice food too (though a little on the pricey side).